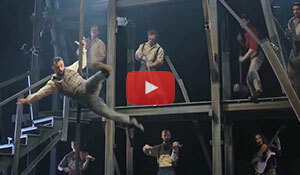 Cirque Éloize brings the Wild West alive with soaring acrobatic feats! Picture this: America is under construction. The West is booming. The railroad is being developed. In the middle of the desert, a town comes to life. A Saloon opens its doors. 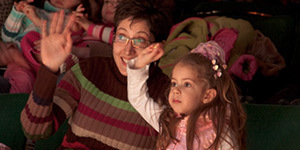 A place to gather and share tales, it quickly becomes a theatre for stories of all kinds. 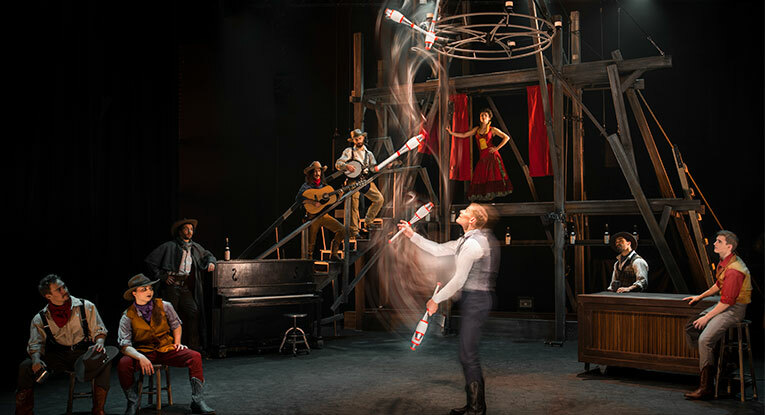 In Cirque Éloize’s SALOON: A Musical Acrobatic Adventure, the infectious energy of live music sets the tone to an acrobatic comedy that sweeps the spectators away in a mad rush of spectacular performances. Positioned at the heart of the renewal of circus arts, Cirque Éloize has been creating moving performances filled with magic and emotion since 1993. 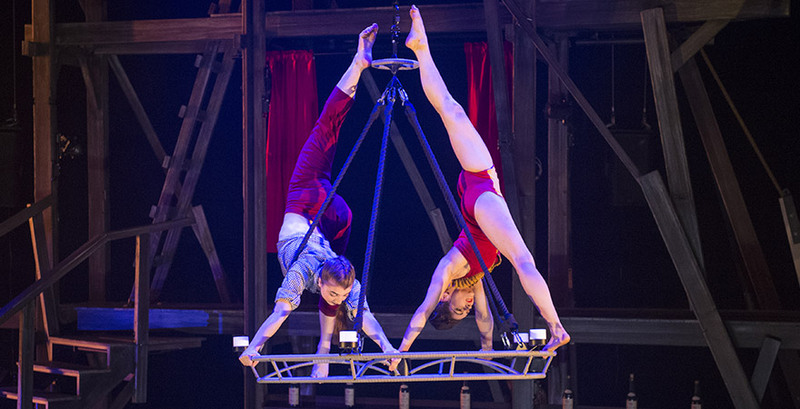 Ranked among the world’s leading contemporary circuses, Cirque Éloize specializes in the conception, production, and distribution of emotionally engaging environments. Its mission is to bring guests closer together by fulfilling people’s need for meaningful entertainment, while ceaselessly pushing the limit of performing arts as a whole. SALOON follows the story of a piano tuner who has fallen under the spell of the saloon’s beautiful Belle, setting him off on a chase worthy of the greatest Westerns. The lovebirds on the run wreak havoc everywhere on their path; from the deserted plains to the depth of the mines—until the ultimate acrobatic showdown. with some cyr wheel and aerial chandelier mixed in. 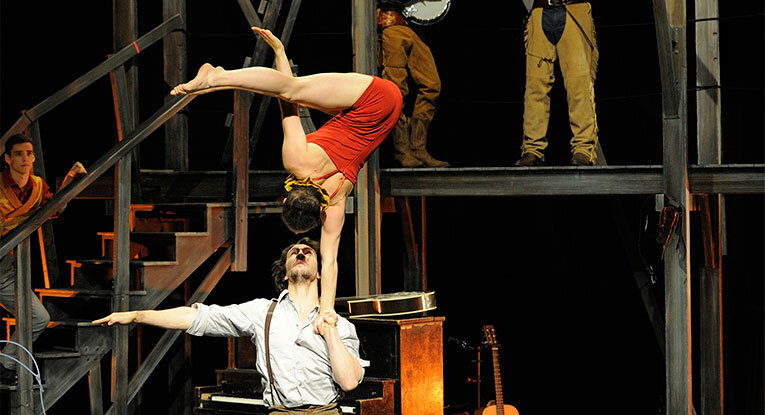 Based on the multidisciplinary skills of its world-class talents, Cirque Éloize expresses its innovative nature through theatricality and humanity, by blending circus arts with music, dance, and theatre, in a path-breaking manner. With 11 original productions to its credit, the organization has presented more than 4,000 custom-made shows and visited some 500 cities in over 50 different countries. Additionally, it has developed more than 4000 custom-made creation shows for international events. Cirque Éloize has taken part in numerous prestigious international festivals and has seduced New York’s Broadway and London’s West End. 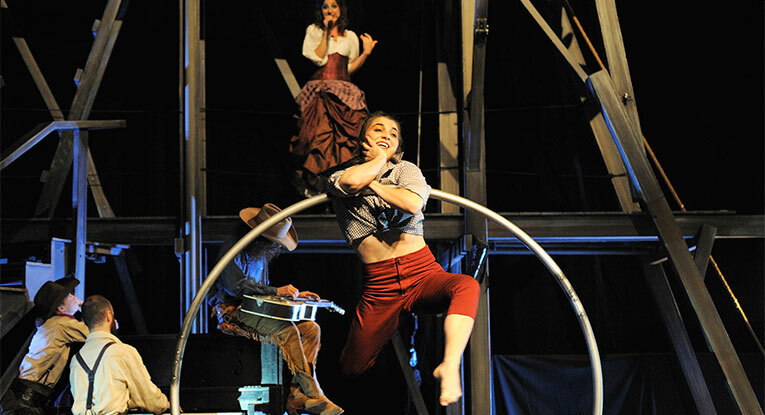 Come venture into the Wild West with us for two performances of Cirque Eloize: SALOON, January 11 and 12 only at 7:30pm at State Theatre New Jersey!